This is my last post for a little bit. We are going on vacation and will be gone until Sept. 1st. I will miss being here with you all, but am really excited about our trip. 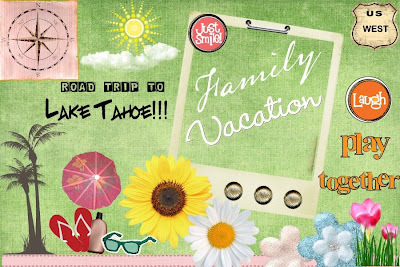 We are going to Lake Tahoe, where we will enjoy some R & R, cooler temperatures and lots of fun activities as well. While we didn't plan it this way, it's kind of cool that we will be staying in Olympic Village at Lake Tahoe, just as the Olympics in Beijing are wrapping up. I'll see you in September! I have been blessed again with a lovely blog award. Actually, I have been blessed with three, but I’m just now getting around to sharing them. It truly touches me, when people think of my blog for passing on these great awards. It honors me that others think my little ol’ blog, is worthy of being awarded. I simply share my heart and thoughts as the Lord leads and sometimes throw in a bit of silly or informational stuff just for fun. I humbly accept these awards with a grateful heart. I will delightfully pass these on to other amazing bloggers, who bless me on a regular basis. However, I will do it separately and after I return from my vacation. I hope you understand. There is an awful lot to do in the final day of preparation, and I have to focus on getting my family (and the house) ready to go. In the meantime, please check out these other fantastic blogs. You just may find that they bless you too! Thank you to Nancie, at her More Than Conquerors blog, for awarding me with two special blog awards. Nancie is always so encouraging in her comments and blog posts and she blesses me with her words regularly. The first is the “Sharing the Love Award”. This lovely award was created by Crystal @ Memoirs of a Mommy in honor of Noah and the donor of his sweet little heart who ENCOURAGES us to SHARE THE LOVE! Thanks Crystal! (Click on Memoirs of a Mommy to learn and read this special love story!) The rules for this award are to pass it along to some people whose blogs you love. 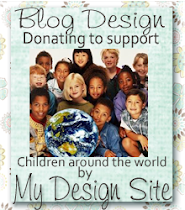 They make you laugh, smile, leave encouraging comments on your blog. You would like to share some love with them because they have uplifted, inspired, encouraged or prayed for you. Please include this paragraph with the link to Memoirs of a Mommy so that everyone knows where this award originated from. The second is the “Friendship Award”. This sweet award was created by LS and Happy @ Serendipity Park to be given to friends, fellow bloggers who leave you kind or uplifting comments and those whose blogs inspire, encourage or motivate you. Thank you to Lori, at her Persevere blog, for awarding me with the most recent blog award. Lori has become a wonderful friend and source of encouragement. She has a great grasp of the Bible and her blog posts are always overflowing with Word and Wisdom. She granted me the “Awesome Site Award”. I’m not sure where the award originated, but I’m awfully happy to have received it. ~ A great vacation destination – Lake Tahoe. ~ A solid and comfortable vehicle to travel in. ~ Time spent in relaxation and enjoyment with my favorite people – Jeff and Reagan. ~ Somewhat lower gas prices. ~ Cooler temperatures and fun activities, along with beautiful surroundings. And on another subject, I’m thankful for the comfort, support and prayers I’ve received from this wonderful blogging community, in relation to my miscarriage on Monday. I’m especially thankful to the Lord for the comfort, love and peace He has lavished on me. It really connects with my post yesterday. No matter what the storm in my life is, I know God has a purpose and plan specific for me that will be fulfilled in His timing, not mine. Sometimes His plans and mine line up, sometimes they don’t, but regardless I trust in Him. I cry out to Him in my time of need and He is there for me. Always. Once again, I take comfort in the song “Held” by Natalie Grant. The title for this post is taken from the classic old hymn by the same name. The song, “It is Well With My Soul,” was written in 1874 by Horatio Spafford. He wrote it following a series of tragic events – the death of his only son, then the Chicago fire (which ruined him financially), and finally the death of all four of his daughters, when the ship they were on (with his wife) collided with another ship and sank. Passing by the area in which they died, on his way to join his grieving wife, he was inspired to pen the words to this now famous hymn. I think it is safe to say that Horatio Spafford knew tragedy intimately. How was he able to respond so well and continue on in the face of such tragedy? Only through the grace of God. He knew God as his Father, Lord, Comforter and Hope. His faith in God was built on the solid rock of Jesus, not the soft sand of circumstance. He and his wife made it through the darkest of days and had three other children, two girls and one boy. Sadly, this boy too died. In 1881 the Spafford family moved to Jerusalem and helped found the American Colony, whose mission it was to serve the poor. They remained there the rest of their days, fulfilling this mission. I’m grateful to say I haven’t experienced this much loss in my life. Like all of us though, I have experienced my own losses. “It is Well with My Soul” came to mind this morning, while I was reflecting on my latest loss. Yesterday I experienced my second miscarriage. Though I suspected I was, I hadn’t been sure I was pregnant, so there wasn’t time to get attached or make plans or fall in love. And yet, somehow I did love. I grieve now for what I’m missing, for what could have been. But I grieve with faith and hope. I know that though I may not know them here and now, I will know my unborn babies someday, in heaven. And I know that my Father, the best Daddy ever, is caring for them better than I even could. I know they will never know pain, sickness, sorrow or death. This comforts me. For those of you who may wonder, yes I did know for sure that I was having a miscarriage. Having experienced this before, I knew what was happening. For the sake of privacy and propriety, I’ll spare the details. Most of you don’t know me personally and don’t know how difficult the journey to having a family has been. It took a year and a half to get pregnant the first time, which ended in the first miscarriage. It then took eight months to get pregnant again. We were so happy when our precious little Reagan was born. We wanted to have another one, so we began trying right away. Because of our ages, we’re both 39, we knew we couldn’t wait. We agreed to the deadline of turning 40 (which is December for both of us) to be the point in which we stop trying to conceive. As that time draws near, I realize that our family may be just the three of us. We know we are incredibly blessed to have Reagan and love her as much as we possibly can. We trust the Lord and His plan for our lives. If that includes another child, we will happily welcome it into our arms. If not, we will focus on the amazing one He’s already given us and be content with her. I know He understands my heaviness of heart, and He is with me always. Still, I’m left with questions there are no answers too. Why is it so hard for us, when we have so much to offer and want it so badly? Why is it so easy for those who abuse what they are given? Why, why, why?! I know there are no answers for these, and the many other questions I have, this side of heaven. Maybe someday I’ll know the answers. Maybe someday it won’t matter. Though I do long for another child, right now, I’m thankful for the wonderful husband and daughter I have. I know I am a Blessed One. I have been fairly inactive for the last couple of weeks. My little Sweetpea first came down with a cold and then unfortunately, a few days later, I did too. We were both sick for over a week and a half. We are both doing better now, but it really kept me from doing many things. I haven't been around much to read and comment to others, but that doesn't mean that I don't still love ya! As far as my writing goes, that has suffered the most. The cold I had really pretty much knocked me out mentally and I found it very difficult to put together a coherent sentence. So now I'm feeling much more like my old self, but still won't be around as much as I'd like. I have a lot of catching up to do (especially around the house) and I'm going to be getting us ready to go on vacation. Beginning this weekend, I won't be around at all, until after Labor Day. So for those of you who faithfully read my posts, I'm sorry this is such a dry period. I know I haven't moved forward with my "Choose Life" series, but as I said, mentally (and spiritually) I just couldn't get it together. I expect to come back refreshed and full of lots to say! I will post a bit this week, but because I have so much to catch up on, I still don't have a lot of time. Thanks for understanding and know that I really miss this! ~ The freedom I have to worship the Lord in the manner which I choose, without worrying about persecution from the government. ~ Building codes and safety regulations that are so stringent (thinking back to the devastation of the earthquake a few months back in the Sichuan province and all of the people, esp. children who were killed in destroyed buildings). ~ National pride and patriotism for the good old USA. ~ Tivo, which allows me to easily record and watch the events I’m interested in when I’m unable to be in front of the TV. Ok, so these are not really deeply spiritual things, but I’m thankful for them anyway! I have a confession to make. I am a cheater. 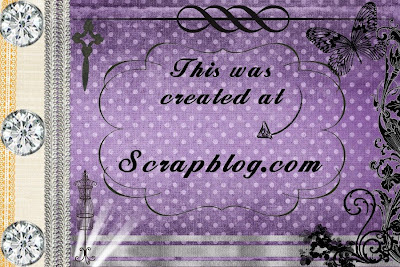 I have received many compliments on the Scrapblog pictures I’ve been posting with my blog. While I’d like to take full credit for creating them, I cannot. I’m sure anyone who knows me very well realizes that something is amiss. See, I’m not creative. I don’t do any type of crafts or art. I understand that I’m pretty good with the written word, but alas that’s where my creativity draws the line. I’ve decided though, that this is too good to keep to myself. It’s time that I share. So the question remains, how do I come up with these beautiful pictures? Well, I found a great website for this that has lots of templates and tons of click and drag elements to make things easy. You can add test boxes, “stickers”, backgrounds and your own pictures. Basically, it’s digital scrapbooking. The best part is that it’s incredibly easy to do. What is this fantastic website? It’s http://www.scrapblog.com/. So, if you’d like to try your hand at it, go for it! One thing though. I like to keep things simple, so for me it’s easiest to export the picture as a jpeg and download to my computer. But there’s lots of other options as well. Have fun and make lots of pretties! Choose life. This command consists of two small and simple words, but the consequences of either obeying or disobeying are huge. I know – I’ve lived it. So why is “choose life” the topic of my latest series? That’s easy. I believe wholeheartedly that life presents us with innumerable choices every day, week, month and year. And these choices have consequences – either for good or for bad. While I knew this topic was to be my next series, I struggled with getting it started. It took me a while, but I finally figured out why. In order to move forward in this study, I first had to look behind, to the history of it, for me. To help you understand why choosing life is so important to me, I have to share a bit of my background. I grew up in dysfunction and poverty. I never knew my father and my mother was emotionally absent. I grew up witnessing physical abuse and experiencing neglect and sexual abuse. In many ways, I was always the “adult” of the family – even as a child. My immediate, and extended, family is plagued by depression, pessimism, substance abuse, poverty and a thoroughly victim mentality. There is no sense of hope, optimism, motivation, joy, peace or life. To say they are oppressed would be an understatement. It’s like they live death. From the time that I was very young, I was dissatisfied with life as I knew it and believed there had to be a better way. I started to look beyond my own family to see how others lived, worked and played. I started to see opportunities to make change. I saw that there were choices out there, and if I wanted something different than what I had, I could choose differently. I didn’t know then that this was Biblical, and to be honest, I probably couldn’t have explained the concept of choices, even though that’s what I was striving for. The most important choice I made was to accept Jesus as my own personal Savior and live according to the Word of God. This however, didn’t happen until I was 30. Looking back, I see how many opportunities were presented to me, once I wanted to see them. I used to believe it was because of God’s grace and love for me, and I still believe that to a point. But I know that God is no respecter of persons and everyone receives as many opportunities to make change in their own lives as I do. I’ve only risen above the circumstances my family continues to live in, because I started choosing the things that would produce or lead to life, rather than the things that produce or lead to death. The opportunities are there for all of us, however we have to not just say we want better, but decide we really want it enough to put action behind it, and that starts with choice. Because of my own personal history, I am passionate about the power, and responsibility, of choice. And it’s easy for me to get frustrated with others who consistently make poor choices, but then complain about where they are in life. In fact, I have to admit that I really have no patience or mercy for those who don’t accept personal responsibility for the choices they make. We cannot choose what happens to us in life, but we can choose how we handle these things and we can choose to learn from them. This is not to say that I always make the right choice (because I don’t) or that I’m totally where I want to be (because I’m not), but I do make an effort to choose life and fortunately, I hit the target more than I miss. I’ve definately made my fair share of mistakes and some of them have been real doozies, but I press on. Attitude leads to thoughts. Thoughts lead to words. Words lead to actions. Actions lead to habits. Habits lead to character. Character leads to destiny. I just want to let everyone know that I did not write this. I “borrowed” it (with permission of course) from Amy at her blog Mom of 4 Saved by Grace. I absolutely loved it when I first read it, and thought it was too beautiful to not pass on to others who may not have seen it at Amy’s blog. I hope you enjoy it as much as I did. You may not know me, but I know everything about you (Psalm 139:1). I know when you sit down and when you rise up (Psalm 139:2). I am familiar with all your ways (Psalm 139:3). 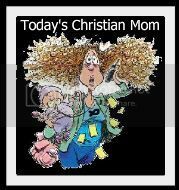 Even the very hairs on your head are numbered (Matthew 10:29-31). For you were made in my image (Genesis 1:27). In me you live and move and have your being (Acts 17:28). For you are my offspring (Acts 17:28). I knew you even before you were conceived (Jeremiah 1:4-5) and I chose you when I planned creation (Ephesians 1:11-12). You were not a mistake, for all your days are written in my book (Psalm 139:15-16). I determined the exact time of your birth and where you would live (Acts 17:26). 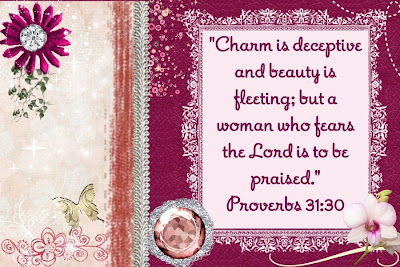 You are fearfully and wonderfully made (Psalm 139:14). I knit you together in your mother's womb (Psalm 139:13) and brought you forth on the day you were born (Psalm 71:6). I have been misrepresented by those who don't know me (John 8:41-44). I am not distant and angry, but am the complete expression of love (1 John 4:16) and it is my desire to lavish my love on you (1 John 3:1) simply because you are my child and I am your Father (1 John 3:1). I offer you more than your earthly father ever could (Matthew 7:11) for I am the perfect Father (Matthew 5:48). Every good gift that you receive comes from my hand (James 1:17). I am your provider and I meet all your needs (Matthew 6:31-33). My plan for your future has always been filled with hope (Jeremiah 29:11) because I love you with an everlasting love (Jeremiah 31:3). My thoughts toward you are countless as the sand on the seashore (Psalm 139:17-18) and I rejoice over you with singing (Zephaniah 3:17). I will never stop doing good to you (Jeremiah 32:40) because you are my treasured possession (Exodus 19:5). I desire to establish you with all my heart and all my soul (Jeremiah 32:41) and I want to show you great and marvelous things (Jeremiah 33:3). If you seek me with all your heart, you will find me (Deuteronomy 4:29). Delight in me and I will give you the desires of your heart (Psalm 37:4). It is I who gave you those desires (Philippians 2:13). I am able to do more for you than you could possibly imagine (Ephesians 3:20). For I am your greatest encourager (2 Thessalonians 2:16-17). I am also the Father who comforts you in all your troubles (2 Corinthians 1"3-4). 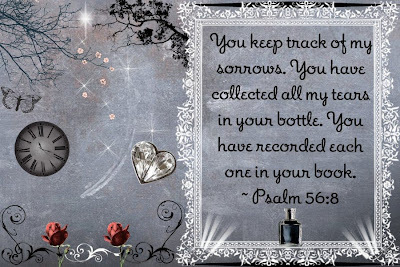 When you are brokenhearted, I am close to you (Psalm 34:18). As a shepherd carries a lamb, I have carried you close to my heart (Isaiah 40:11). One day I will wipe away every tear from your eyes (Revelation 21:3-4) and I'll take away all the pain you have suffered on this earth (Revelation 21:3-4). I am your Father, and I love you even as I love my son, Jesus (John 17:23). For in Jesus, my love for you is revealed (John 17:26). He is the exact representation of my being (Hebrews 1:3). He came to demonstrate that I am for you, not against you (Romans 8:31) and to tell you that I am not counting your sins (2 Corinthians 5:18-19). Jesus died so that you and I could be reconciled (2 Corinthians 5:18-19). His death was the ultimate expression of my love for you (1 John 4:10). I gave up everything I loved that I might gain your love (Romans 8:31-32). If you receive the gift of my son Jesus, you receive me (1 John 2:23) and nothing will ever separate you from my love again (Romans 8:38-39). Come home and I'll throw the biggest party heaven has ever seen (Luke 15:7). I have always been Father, and will always be Father (Ephesians 3:14-15). My question is will you be my child (John 1:12-13)? I am waiting for you (Luke 15:11-32). 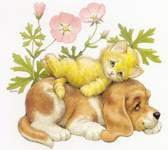 It is time once again for Friday Fiction, which is usually hosted by Patty at her Patterings blog. 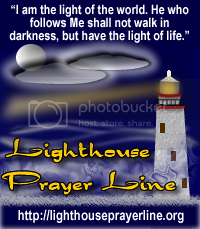 However, this week it is being hosted by LauraLee at her LauraLee's Lifesong blog. This was yet another early entry in the FaithWriters Weekly Challenge. If you would like to read more great fiction, or participate, please go to Friday Fiction. I hope you enjoy the story. Sophia looked at the little girl sitting across from her. They were in a diner, the fun, old-fashioned kind with black and white checker floors and loud oldies music playing in the background. She was glad she brought her here. Heaven knows the child could use some fun. “Yes, Jenny.” Sophia smiled and looked into the big, brown eyes that were fixed on her. They were eyes that seemed much older than a mere six years. They were eyes that had seen too much, and held too much pain for one that young. “I’m really coming to live with you? For always?” Jenny looked unsure, as if she were ready to be disappointed again. “I’m glad. I like it at your house.” Jenny went back to eating her fries. Sophia was glad too. It would be nice to have her niece living with her. Nice for her, but it would be lifesaving for Jenny. 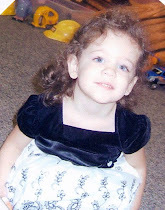 Such a beautiful child, she thought, and the spitting image of Natalie, at that age. Natalie was Sophia’s younger sister and Jenny’s mom. She had finally agreed to sign over custody of Jenny to Sophia. “Aunt Sophie, when I’m living with you, will I be in the way? Mommy said I was always in the way.” With that, Jenny took a big drink out of her chocolate shake. “Yeah, I think so. Is that why Mommy didn’t love me, because I was in the way?” Jenny asked sadly, while picking up her burger. Sophia was struck by how simply and matter-of-factly Jenny spoke. “Oh Jenny, your mommy loves you. She really does. She just, well, she just has problems and that’s why she’s letting you live with me.” She had no idea how to explain to the child the devastating affects that drugs had on a person, or how it could ruin lives. Sophia had been so relieved when she talked Natalie into letting her have permanent custody. It hadn’t been easy. For some reason Natalie believed that giving up her child made her a bad mother, not the neglect and abuse. Sophia found she had to resort to manipulation to get Natalie to see that she would be the better caregiver. Natalie, if you don’t have to worry about Jenny, you can do what you want and come and go as you please. You won’t have to try to remember to get her up for school or get her to bed at night. She didn’t like to have to manipulate her sister, but it worked. In seeing how it would benefit her, Natalie finally agreed. “Aunt Sophie, are you going to cook for me? ‘Cause sometimes Mommy would forget and I would be hungry, sometimes for days.” Jenny was finishing the last of her fries. The child never left anything on her plate. Just in case. “Yes Jenny, I’m going to cook for you and I promise I won’t ever forget, ok? And on top of that, you and I are going to have a lot of fun too!” said Sophia. Jenny smiled and drank the rest of her shake. When she heard that, Sophia knelt down and hugged her niece. “I’m so glad” she softly whispered. Sophia laughed, “We might be able to arrange that.” As she walked around the car, she thought, we’re going to be ok. It will take time and effort, but we’ll be ok. Thank you Lord, for this amazing child, please help me to care for her the way she deserves to be. Lord, help her to feel safe and secure and happy. Help her to laugh and be a child again. ~ Facial tissue. Her poor little nose is running terribly. ~ Veggie Tales, which somewhat distracts her from how she is feeling. ~ Baby Tylenol, which is keeping down her fever. ~ Good health. I am soooo thankful that she has always been healthy and that this is a minor illness – I know it can be so much worse. ~ Good temperament. Even while being sick, she’s in pretty good spirits. ~ Being a SAHM. I realize how blessed I am to be able to stay at home with her always, but especially when she is sick. I know there are many who don’t have that option. 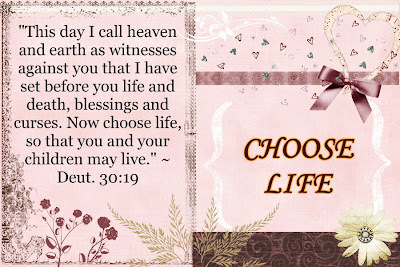 Currently I am working on my first “Choose Life” post, but will continue to post other blog entry’s as led. This awesome video was sent to me via email and I just had to share. It’s amazing! I am constantly astonished at the talent and creativity that is out there. I hope you enjoy it as much as I did. It is time, once again, for me to delve into another series. My last series, based on The Fruit of the Spirit, was thoroughly enjoyable to do, and was a great way to bring a healthy dose of fresh Fruit into my life. According to the many wonderful comments I received, my Fruit series was very well-received by my readers, and I’ve had several mention that they were awaiting the next one. After careful consideration and prayer, here it is: Choose Life. I really believe in the power of this subject. And I think God does too. In life, we all face many different tests and trials. Some we may see coming, like finals or mid-terms, others may be more like the dreaded pop-quiz, but all are open-book. And because of His great mercy and grace, He has given us the ultimate resource book for all of these tests – the Bible. Everything we do, say, think, feel, believe, etc. either leads to life or to death. It says in Deut. 30:19, “This day I call heaven and earth as witnesses against you that I have set before you life and death, blessings and curses. Now choose life, so that you and your children may live.” Life happens all around us, and we can’t control the circumstances that confront us, for good or for bad. But we can control the way we react to those circumstances. We can control our attitude, and consequently our altitude. We get to choose whether we rise above our circumstances and soar like the eagle, or stay down in the dumps, wallowing in our circumstances like a pig that wallows in the slop of its environment. So now I invite you to join me on this new journey to see how we can choose life and blessings over death and curses in our daily lives. This is not some New Age or humanistic philosophy, but rather it’s what the Lord teaches us through His Word. God not only created us, but He has given us free-will, which is the power of choice. He desires for us to live with the fullness of life and blessings that He has to offer, but ultimately it is our choice. Unlike the Fruit of the Spirit series, which had a predetermined number of posts based on the named Fruits, the Choose Life series is more open-ended. Some of the topics will be based on words, thoughts, emotions, attitudes, relationships and actions, with the possibility of more being added, as the Lord leads. I am eager to see where this journey will take me, and I hope you are too. Thank you for continuing to read and support my blog and thoughts. Were I to count them, they would outnumber the grains of sand. When I awake, I am still with you. I truly love this bit of Scripture because it is a reminder that God created me specifically the way He wants me to be. When I am feeling down or insecure about myself, this is what I think of and it brings me great comfort. I am a special and unique individual, created by the God of the universe, and He treasures me as His child. The same goes for you too! How wonderful is that? 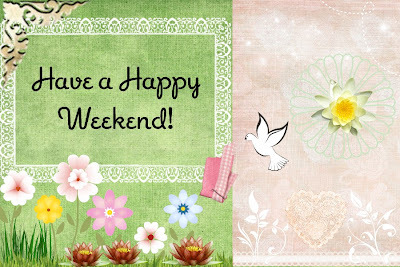 It is time once again for Friday Fiction, hosted by Patty at her Patterings blog. This was another early entry in the FaithWriters Weekly Challenge. If you would like to read more great fiction, or participate, please go to Friday Fiction. I hope you enjoy the story. “It’s too late. I always thought I’d have more time. I didn’t realize how precious it was, till now. It’s so easy to spend, fill and waste, but it’s limited. I never realized that”, Abigail said to her sister Alanna on the phone. She was completely stunned as she sat there looking out the window of her tiny apartment. There was so much yet that she wanted to do. To do, not accomplish or excel at, but do. “I want to get married, have a family, travel, learn to dance and go skydiving, I want to… There’s just so much!” she cried into the phone, tears falling down her face. Alanna was equally stunned. “Are you sure? I mean doctors can make mistakes, have you gotten a second opinion?” She was trying to control the fear and trembling she felt. “Abigail, I don’t know what to say! How can this be happening? How can I lose my sister?” Alanna was openly crying now, overwhelmed by the sorrow she felt. I have to get control of myself and be strong for Abby, she thought. “What can I do for you? I mean of course I’ll pray, but is there anything else I can do to help? I love you and I’ll do anything for you,” she said, taking a big breath. “Of course. I have to call Mom and Dad.” Abigail responded, hanging up. She realized Alanna’s work in the ministry was just like her work at the firm – all-consuming. She never took time away from it to actually enjoy the life God had given her. Sadly, Abigail prayed, Oh Lord, help her to see that there is so much more to life than work, even if that work is for You. Help her to realize that her time here is limited and You came to give us life more abundantly, not just work. Open her eyes Lord, so she doesn’t make the same mistake I did.